East Chinatown will be hosting a celebration on Feb. 10 to welcome the Year of the Pig which will include a lion dance along Gerrard Street. Photo: Submitted. Residents celebrating Chinese New Year this month can look forward to a variety of events in the area. This year will be known as the Year of the Pig, where the pig is known as the 12th and last of the Chinese zodiac signs. Each zodiac sign is assigned a specific animal according to their birth year. Those assigned to the Year of the Pig are known to be realists who thoroughly enjoy life, according to Chinese mythology. The Pig has also been known to govern a lunar month for the Lunar New Year. In a Lunar New Year, celebrations like the Lanterns Festival marks the beginning of a year where the months are coordinated by the cycles of the moon. Those who wish to make their own lanterns can attend the Chinese New Year Family Time program at Riverdale Library on Saturday, Feb. 2 at 10:30 a.m. Staff will explain the story of how the years were named, and talk about the importance of the Lunar New Year. Children will also get the chance to write a wish for 2019 and tie it to the wishing tree at the library. Jones Library will also be holding a Chinese New Year Crafternoon program on Saturday, Feb. 9 from 11 a.m. to 4 p.m. where kids can make pig stick puppets. The puppets will be available in all three lucky colours – red, yellow, and white. Residents can also celebrate at the East Toronto Lunar New Year Community Fair to be held at Gerrard Square on Saturday, Feb. 23 from 11 a.m. to 3 p.m. 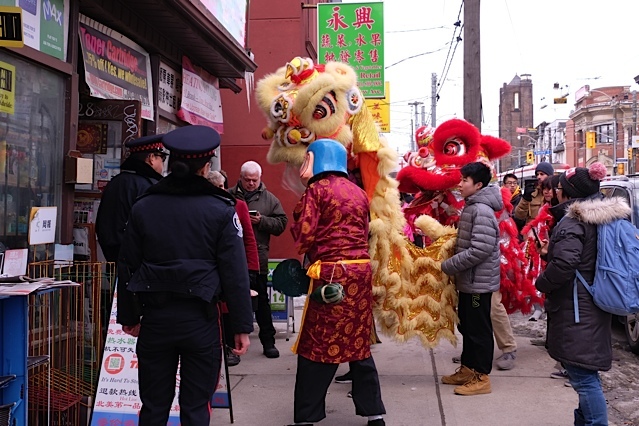 In addition, there will be a grand celebration in East Chinatown on Sunday, Feb. 10 featuring a traditional lion dance procession which starts at the Toronto Archway located at Broadview Avenue and Gerrard Street. It then makes its way around East Chinatown, stopping at local shops along the way. Tradition says that if the lion gives you a red package, it symbolizes good luck. Toronto-Danforth Councillor Paula Fletcher explained in an interview with Beach Metro News that she is honoured to be a part of the celebrations, especially since it is such an important holiday for the Chinese community.